It's Time to Meet the Spartans! It&apos;s Time to Meet the Spartans! 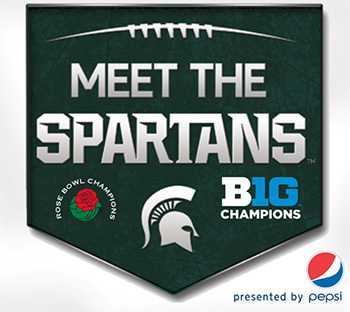 Get a poster or a football signed by players and coaches Tuesday at &apos;Meet the Spartans&apos;. Its time to get excited for another great season! The wait is over Spartan football fans. It&apos;s been a hot fun summer but the real fans have been thirsting for more green and white gridiron glory since we started to see the last of the highlights of last winter&apos;s amazing Rose Bowl game. Everyone&apos;s excited, and why not?! We&apos;re coming off one of the most successful football seasons in Michigan State University history! Big Ten Champions and Rose Bowl Champions. Sounds beautiful, doesnt it? Well while we have all kinds of great football to look forward to in coming weeks, this Tuesday (tomorrow!) August 12th, we get an opportunity to get up close and personal with this years Spartan warriors and our football team&apos;s fearless leader, Coach Mark Dantonio. Just like the Spartan Football program has improved a bunch in recent years, this event has improved as well. How? Well to start, they&apos;ve moved the event right onto the battlefield itself. Yep, right on the field of Spartan Stadium. The event is FREE and gates open at 4:30 so get there early, grab this years promotional football poster and jump into line to get it signed! You can also bring Spartan gear to be signed, or buy it at the MSU Sideline Shop inside the stadium, to make yourself a cool memento to treasure for years to come. One word of caution and thoughtfulness I will share on this, as someone who has been to the event many times in the past. Bring a thing or two to sign, but don&apos;t be greedy. The team is giving their time to do this for all the fans, so dont monopolize the players getting 20 things signed, while some kid doesn&apos;t get a turn because you took so long. Just remember the Spartan motto - You&apos;re only as strong as the warrior standing next to you. Fans that attend the 2014 Meet the Spartans event will also enjoy games, giveaways, get a chance to see both the Big Ten Football Champions trophy, the Rose Bowl Trophy and even get field and press box tours as well! Another cool thing new this year - COME HUNGRY! Attendees are going to be able to enjoy all you can eat concessions for just $5! How great is this? Pig out on some stadium grub, get a tour of some of the cool new aspects of Spartan Stadium, then meet and get autographs from this year&apos;s Spartans! Sure does make you feel part of the program to see these guys up close, ask them a question or two and then just take in all the sweet Spartan surroundings. Another Spartan Football season is in front of us. While there are some big moments ahead of us its time to start with this signature meet-and-greet event. Go Green! Go White! See you all tomorrow night!